Whatever your trading strategy on Betfair - scalping in-play horse races, betting on a tipster's choice, laying on next goal in soccer or anything else - the first thing to do is find suitable markets and selections to bet on. 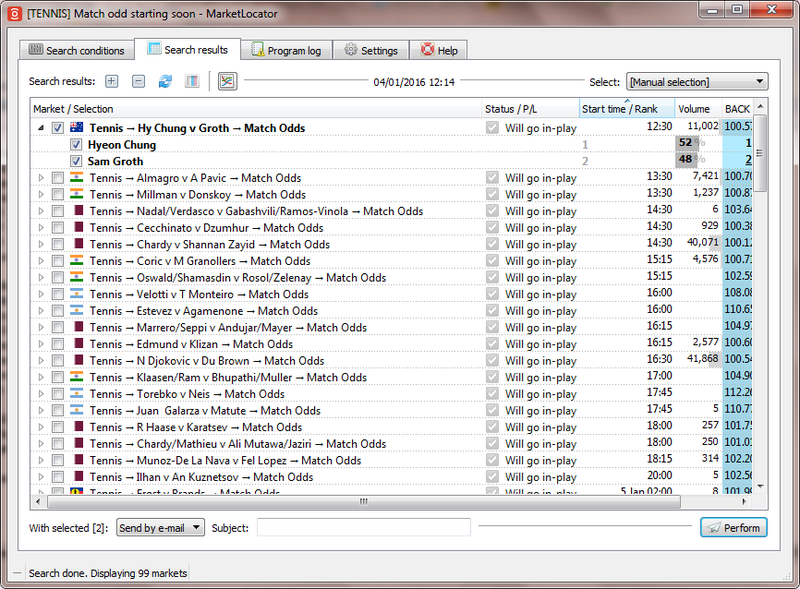 Betfair has lots, and you may spend hours on just looking for your markets before you actually start trading. That’s when you definitely need Betfair automation software to do it for you. 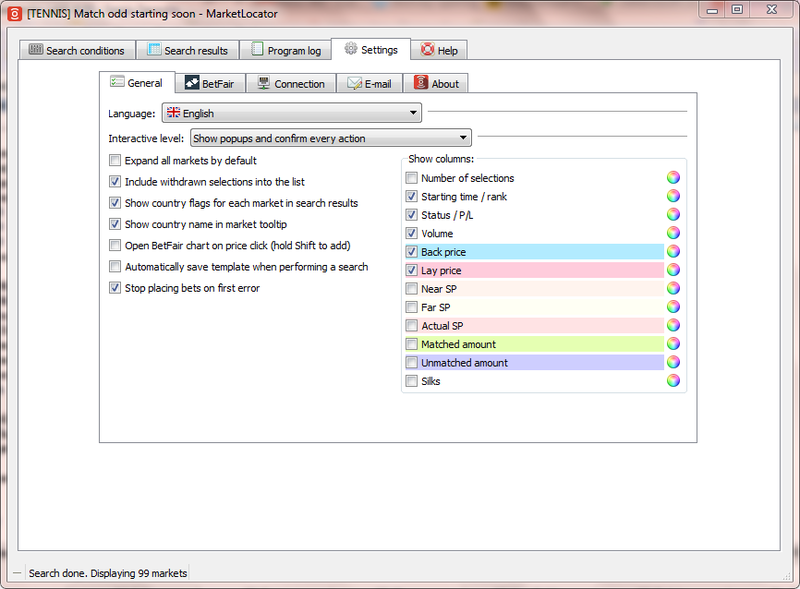 Market Locator allows you to automatically search for markets that suit your criteria. You can save hours of time by making the software look for markets with high liquidity, good book percentage, those starting soon, taking place in a particular country etc. 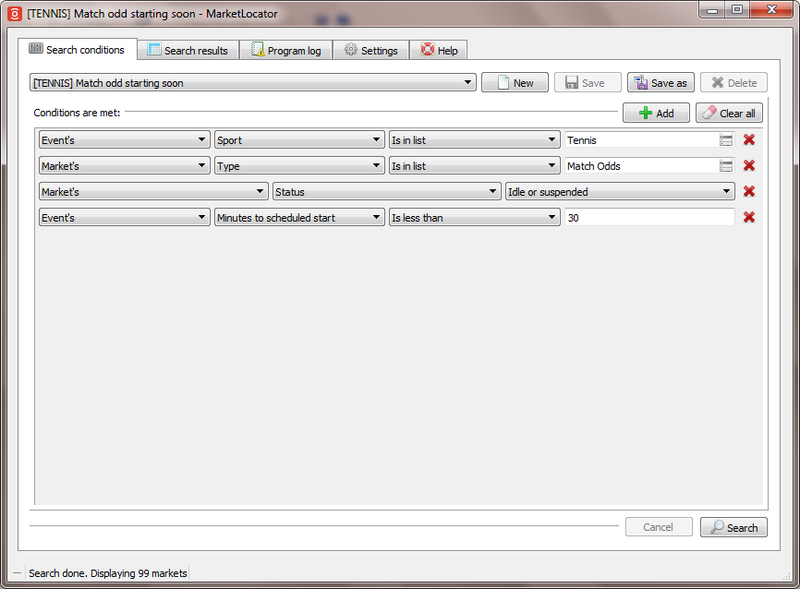 Market Locator can find specific sports, types of markets (win/place or Match Odds, Correct Score etc.) or even markets with a certain pattern in their names (e.g. "Hcap" or "Doubles"). If you are after certain selections rather than markets (e.g. you're looking for a particular horse), then it is also easy to find it by searching for its name or properties (such as name or last traded price). Upon finding your markets and selections, you can quickly place bets on them, save them to a text file or even email them back to yourself. You can specify unlimited search criteria and even use predefined templates that will limit your effort to just one mouse click! The program is easy to configure and does not take up much memory or CPU. Market Locator gives you a huge advantage over other bettors. What usually takes hours of tiresome browsing through event categories and lists will now take a couple of seconds! Adjust the look and feel of the software to your taste. Can run on both Windows and Mac OS.